Goðafoss in northern Iceland, just off the Ring Road. An odd duck (Straumönd) braves the rapids of Goðafoss. Akureyri, population 17,000, is Iceland’s largest city outside the greater Reykjavík metropolitan area. Lovely! The first place we spotted in the center of town was the Eymundsson Bókabúð (bookstore), where we found Freyjuginning, the Icelandic translation of The Tricking of Freya. To the right of Freyjuginning you can see printed volumes bound together and stacked high -- this is the newly released report investigating what really went on prior to the Kreppa (economic collapse of Iceland) and is a best seller! Icelanders want to know what really happened. We arrived in town just before my TV interview, so I had to rummage for clothes out of the suitcase in the car and change in a local café. All our clothes seem to be covered in a fine sprinkling of ash, road dust, and strangely colored sands from the sulphur springs. The last event of the book tour was held at the beautiful library in Akureryi, where we were quickly befriended by Holmkell Hreinsson, the library’s charming director. 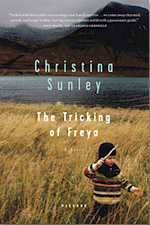 By now I am fairly confident reading out loud from my novel in Icelandic—and the audience laughs in the right places, so I know they are understanding me. We had a good turnout and I heard many interesting stories from members of the audience afterwards as I signed books. One Icelandic woman told me about how her family had been cut off from their relatives in America for almost a hundred years. This was an Icelandic family that converted to Mormanism and emigrated to Utah in the late 1800s. Their kin at home in Iceland were so angry at them for leaving that there was no communication for nearly a century… now the ties are being renewed again, and she told me how last summer she hosted a young Icelandic-American Morman relative of hers from Utah. Our hosts: Solveig Hrafnsdottir, who did a great job setting up my book event in Akureyri, and her husband Kristján, who goes by “Kiddi”. I’d never met out hosts in Akureyri before we arrived to stay at their house for three days—in fact, we’re not even related (that we know of). Yet we were all immediately at ease and talking and laughing late into the bright night. Oliver with Kiddi on his boat in the harbor at Akureyri.